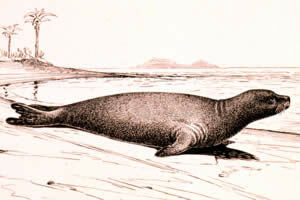 Scientific Sketch of a Caribbean Monk Seal from the U.S. National Museum. WASHINGTON, D.C. -- After a five year review, NOAA’s Fisheries Service has determined that the Caribbean monk seal, which has not been seen for more than 50 years, has gone extinct—the first type of seal to go extinct from human causes. Monk seals became easy targets for hunters while resting, birthing, or nursing their pups on the beach. Overhunting by humans led to these seals’ demise, according to NOAA biologists. The last confirmed sighting of the seal was in 1952 in the Caribbean Sea at Seranilla Bank, between Jamaica and the Yucat�n Peninsula. This was the only subtropical seal native to the Caribbean Sea and Gulf of Mexico. "Humans left the Caribbean monk seal population unsustainable after overhunting them in the wild," said Kyle Baker, biologist for NOAA’s Fisheries Service southeast region. "Unfortunately, this lead to their demise and labels the species as the only seal to go extinct from human causes." Caribbean monk seals were listed as endangered on March 11, 1967, under the Endangered Species Preservation Act, and relisted under the Endangered Species Act on April 10, 1979. Since then, several efforts have been made to investigate unconfirmed reports of the species in or near the Caribbean Sea, Gulf of Mexico, southern Bahamas, and Greater Antilles. These expeditions only confirmed sightings of other seal types, such as stray arctic seals. Five-year status reviews are a requirement of the Endangered Species Act to ensure that the status of a species listed as threatened or endangered remains accurate and has not changed, for better or worse. The most recent review began in 2003. NOAA’s Fisheries Service plans to publish a proposed rule in the Federal Register, seeking public comment to permanently remove Caribbean monk seals from the Endangered Species List. Species are removed from this list when their populations are no longer threatened or endangered, or when they are declared extinct. Hawaiian and Mediterranean monk seals are endangered and at risk of extinction with populations dipping below 1,200 and 500 individuals, respectively. NOAA’s Fisheries Service is responsible for protecting the Hawaiian monk seal. That population is declining at a rate of about four percent per year, and NOAA biologists predict the population could fall below 1,000 animals in the next three to four years, placing the Hawaiian monk seal among the world’s most endangered marine species. Unlike the Caribbean monk seal, Hawaiian monk seals face different survival challenges, such as lack of food sources for young seals, entanglement in marine debris, predation by sharks, and loss of haul-out and pupping beaches due to erosion. Other species of marine mammals that have gone extinct in modern times include the Atlantic gray whale (1700s or 1800s) and stellar sea cow (late 1700s), presumably due to overhunting by whalers. Exploitation of Caribbean monk seals began during the same time period. Caribbean monk seals were first discovered during Columbus’s second voyage in 1494, when eight seals were killed for meat. Following European colonization from the 1700s to 1900s, the seals were exploited intensively for their blubber, and to a lesser extent for food, scientific study and zoological collection. Blubber was processed into oil and used for lubrication, coating the bottom of boats, and as lamp and cooking oil. Seal skins were sought to make trunk linings, articles of clothing, straps and bags. Scientists are unsure about exactly when Caribbean monk seals went extinct. Although there have been no confirmed sightings since 1952, it is conceivable that undetected seals persisted for a short period thereafter. The seals lived 20 to 30 years, so experts believe that some adults possibly lived into the 1960s or 1970s.